Guaranteed Gold is a 16.1hh 1998 cremello Thoroughbred stallion by Milkie's Desire out of Distingold, who combines the best attributes of parents. With hundreds of thousands of Thoroughbreds being entered into the Jockey Club stud book this cremello colt was the first of his kind to be registered with the Jockey Club. Guaranteed Gold has a wonderful temperment and is a true gentleman while at home, at the shows or in the breeding shed! 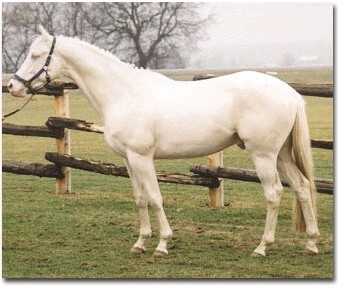 He's also shown on the cremello page showing that cremellos can do as well as look good! Thanks to Sarah Dekker of Trinity Breeders, Ontario, Canada for allowing me to display this photo of their superb stallion – isn’t he just lovely! Photo Credits to Christina Handley.